Combined together by popular demand! 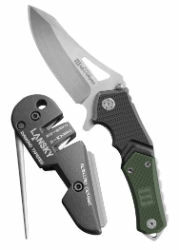 This pack combines Lansky's number one selling sharpener the Blademedic® with their number one selling knife, the Responder. The Responder Quick Action Knife is an EDC (Every Day Carry) knife. Ballistic glass filled nylon scales are easy on the pockets, while the thumb hole and flipper allow for lightning quick deployment.